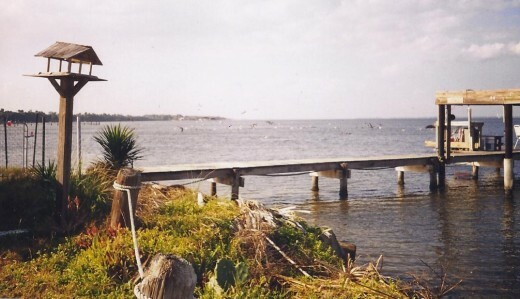 Salt Water Fishing off of docks is a great way to cast net for your bait fish. You will pay for your net in no time at all by getting your own bait fish. Also ask permission to fish off boat docks behind waterfront resorts/restaurants. There is some of the best fishing in Brevard County, Florida. 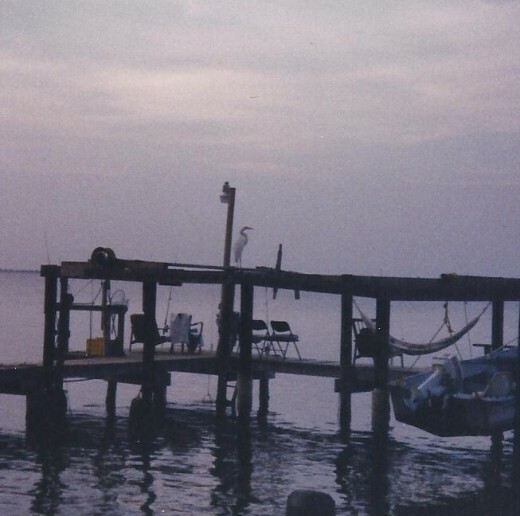 There is an abundance of Saltwater Catfish, Snook, Red-drum and Trout under these docks. 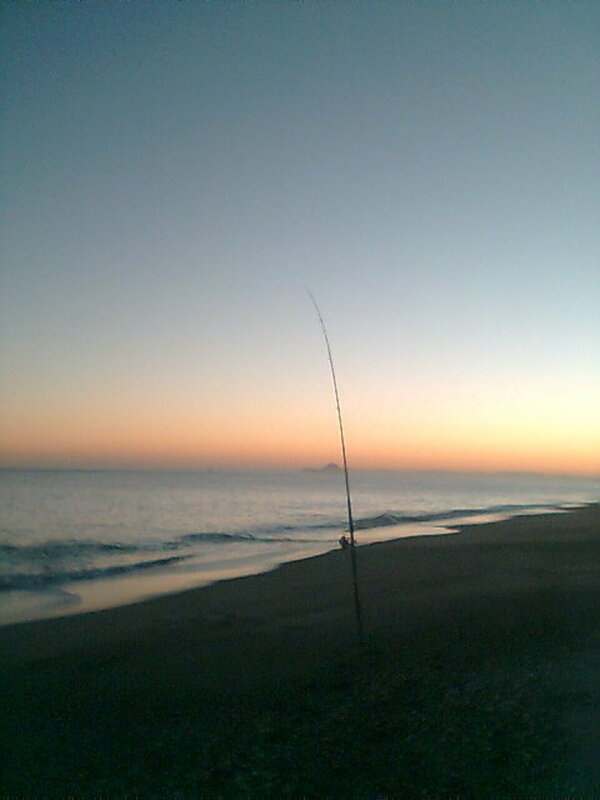 The sun is on the rise and my salt water fishing pals and I are ready for the hits, and the feast afterwards. I usually share the morning sun rise with a White Egret perched on the upper dock boards. White Egrets are also called Great White Herons. They are an elegant bird slightly smaller than a Blue Heron with impressive wing spans. They usually wad into the flats of the Indian River lagoon and use a deadly stab of their yellow bill to catch their prey. You can see White Egrets standing in fresh water and salt water. Like the Blue Heron they nest with sticks high in trees usually on deserted islands. Meet Fred. He is quite a character and very jealous of me sitting with other birds. Blue Heron's are monogamous and he stands about three and a half feet tall. They court a female by flying around his nest with twigs and sticks in his beak. 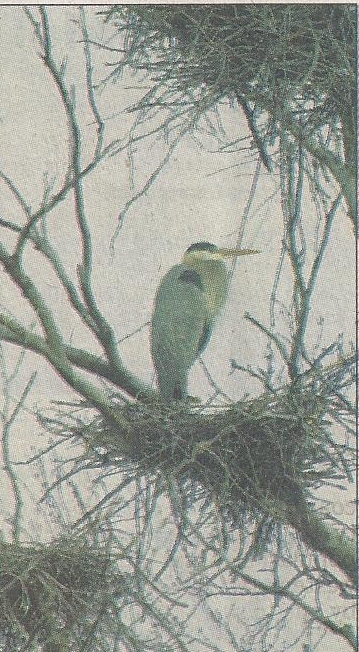 ( A young male Blue Heron will build a new nest). This is the nest building ritual and when the female accepts the nest, they click their beaks together. The female will lay two to three light blue eggs and both the parents will feed the young regurgitated fish. Fred's nest over looks the bay and dock I fish from. Oh, look now, here comes Fred for his morning fish. I always throw him a mullet or two. 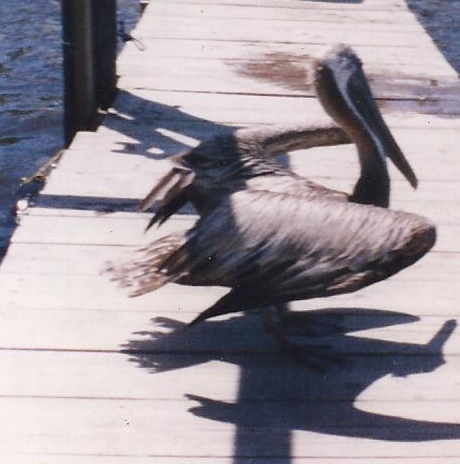 The brown Florida Pelican is a large bird that is elegant in flight but clumsy on land. The picture here shows a young bird and after about a year their heads turn white but get a yellow haze to their head feathers as they age. Pelicans fly in line formations and dive for their food sometimes submerging their whole bodies for a fish. So they enjoy an easy meal when they can get one.They are friendly birds especially if you are cast netting for fish. They will attack your net for fish and rips holes in the net, so you may as well just give them one in their large gullet throated bill. Their bill also has a hook at the front of it that can hook a nasty chunk out of your skin. These Brown Pelican's throat will go red when they are mating. 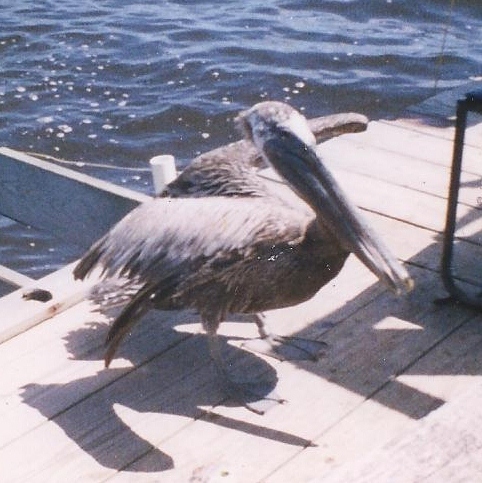 If you do get a pelican tangled in your line, pull him in the water up to the dock and cut the line as close to your hook as safely possible. This way the pelican won't fly away with a long line that can tangle and snag him to a bush or rocks. I have a great fishing time with these two pelicans that hang out near my place in Palm Bay Florida. 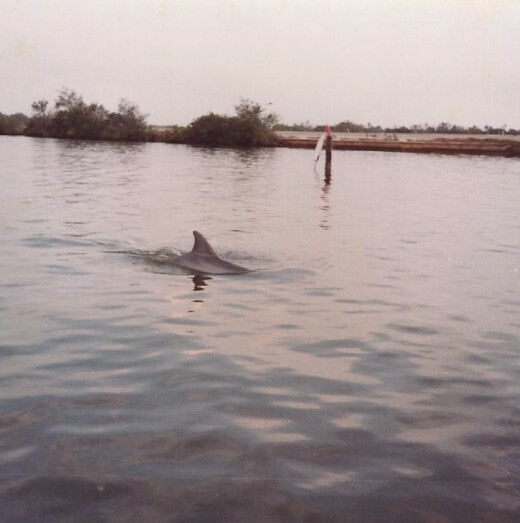 Bottlenose Dolphins are native to Florida's Inter coastal waters. They are beautiful, intelligent and athletic animals. You can spot Dolphins clearly when they surface with a huge puff of air and water from an air hole on top of their heads. These animals are grey in color and about five feet long with huge tails they push themselves airborne with. What entertainment I get, when the three dolphins. 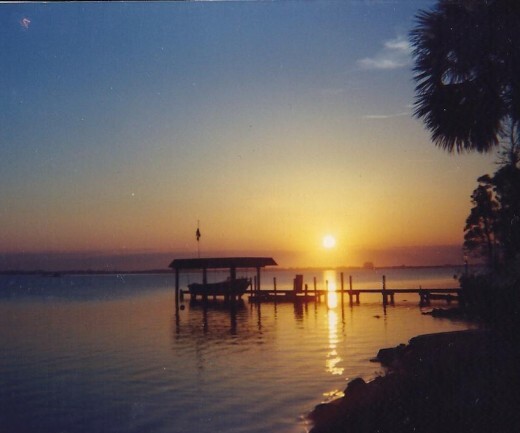 ( that frequent this bay of water in the Indian River lagoon) come crashing into the bay, with mounds of mullets taking to air trying to escape their fate. I have actually seen the pelicans skid to a halt atop a dolphins back, in to water to scoop up a gullet full of finger mullets in their throats. What a sight that is. You can see this action for your self, in the first picture and the first video. It is an awesome show every other day. Ringo was in the neighborhood when I moved in. He will sit with you on the dock for hours purring away contentedly awaiting his fish lunch. 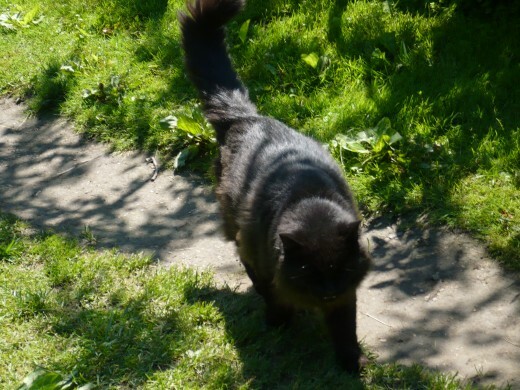 Everyone in the mobile home park feeds Ringo a Black large Tabby cat. 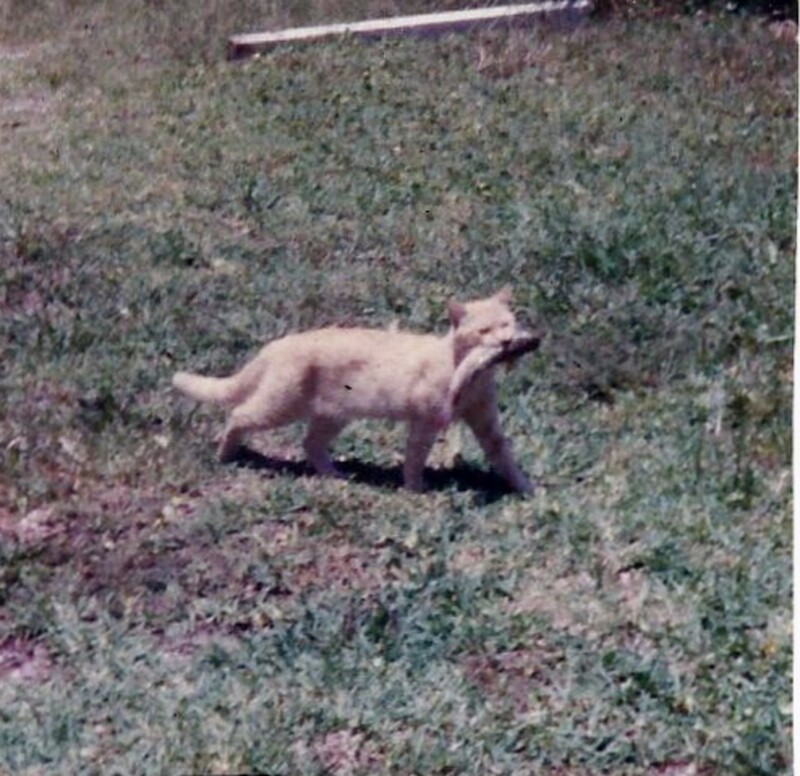 Ringo was a hoot, when he bites off the poisonous tail of a lizard and his eyes cross. I never did get a picture of his cross eyes and he never seemed to learn not to do it. It didn't make him sick, he always came for fish anyway. At least that is what my neighbors and I thought it was that crossed his eyes. Leo wandered into the trailer park one day and just started to hang around my yard. I think it is awesome he will clean up a fish almost as big as him. These cats are my fishing companions every day. I love to sit in nature and count my blessings. Even if I don't catch a fish today all my fishing buddies are here for daily entertainment. Everyday is like a trip to Sea World. Dolphins swimming near the bow of a boat. Fishing tips and what bait to use to fish the flats of the Florida East Coast. 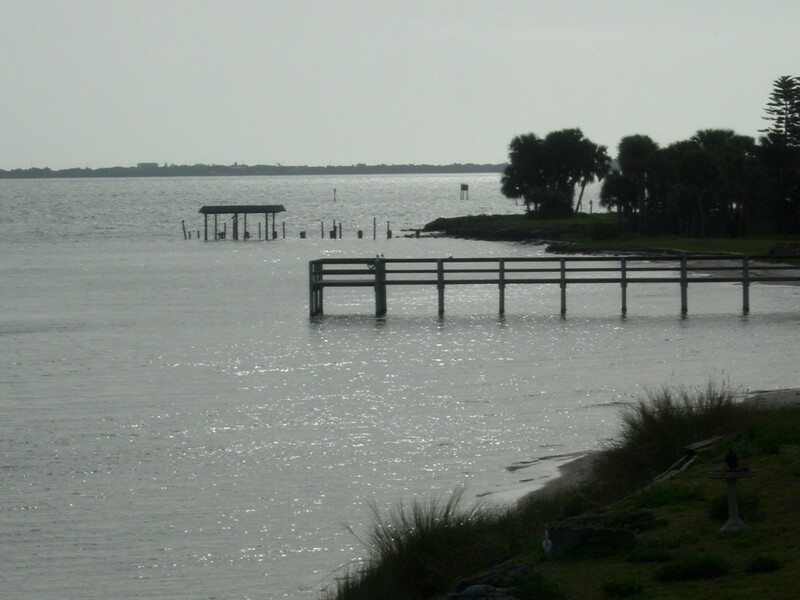 Intercoastal Waterway known as the Indian River. 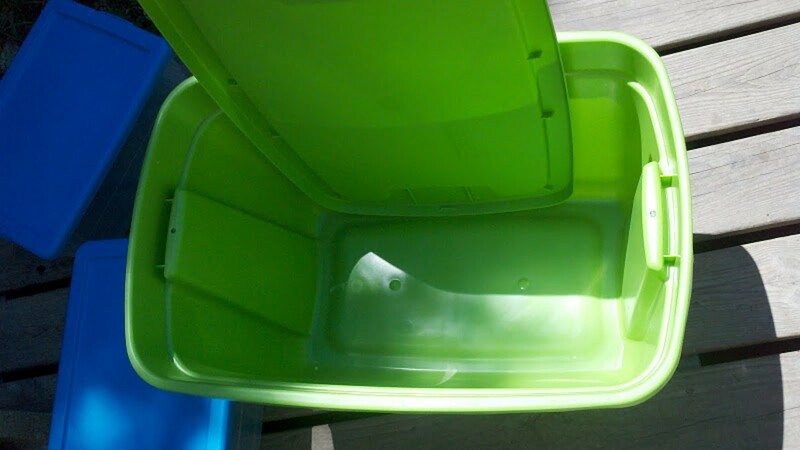 These tips are for the fishing area of Titusville to Sebastian Florida. 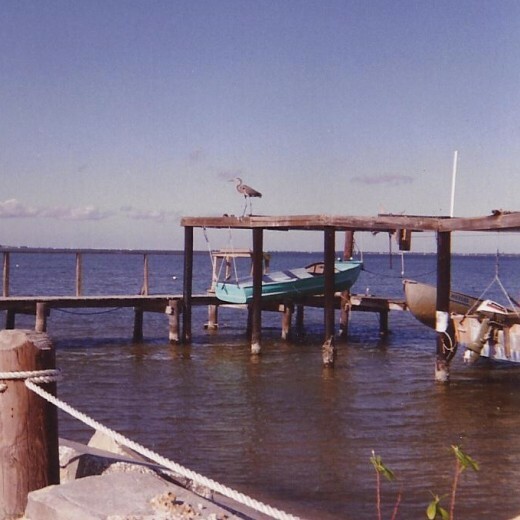 Crabbing in eastern Florida with a chicken back tied to the end of a string. 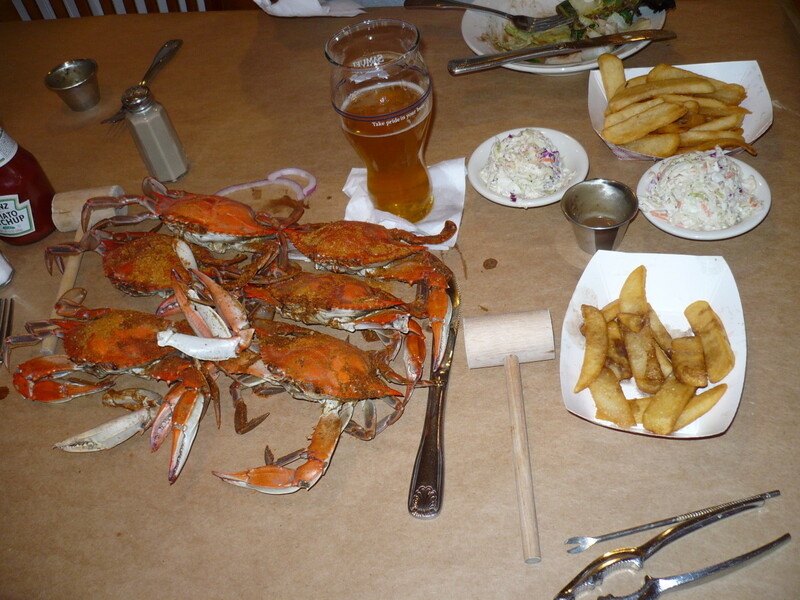 I love blue crabs. Try this great recipe. @ thunbi7 Thank you so much for the compliment. I appreciate your comments. Have a great day. @truthfornow thanks for commenting and Leo was a hoot to fish with. I loved them all. When we are close to nature we are close to God. I am always at peace by the water. Sounds lovely to have so many companions on your fishing adventures. That picture of Leo with his fish is so cute. He is walking like a king. Thank you Glimmer Twin Fan. They make great fishing buddies as long as you feed them. I have also seen all white pelicans with black tipped wings, flying in a line of fifteen birds. They really are graceful, and elegant to watch. These birds migrate to Florida. I would love some warm Florida weather about now. Love the pics and even though I don't fish, I'd love to to have a pelican fishing buddy. They have got to be my favorite bird. So graceful when they fly. Nice hub. Thank you always exploring. I love the mullet runs and I have been in lots of boats where the Dolphins swim in the front like that. It is so cool. Thank you jlcaudill07. 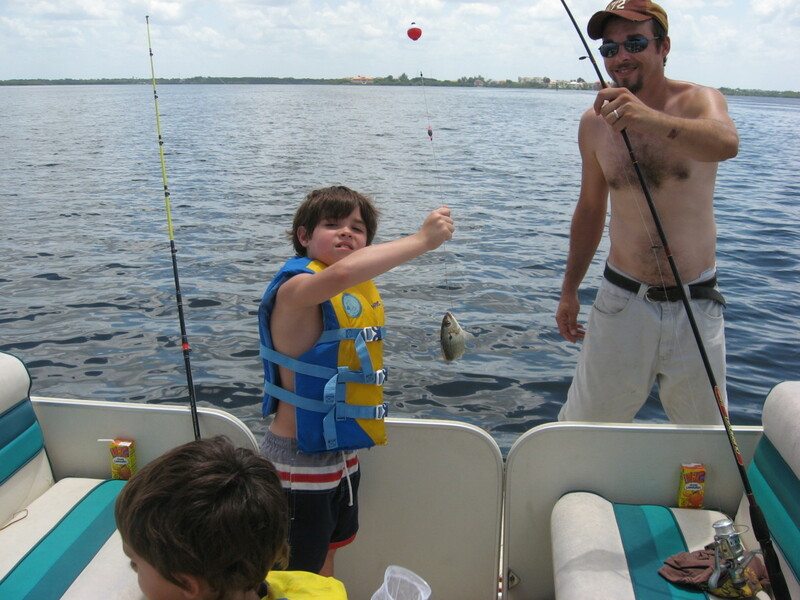 You will have so much fun watching all the nature Florida has to offer you won't even care if you catch a fish. When you do keep the tip of your pole held up and the fish won't have a chance to jump the hook. Have fun, salt water fishing is awesome! This was a very interesting hub. 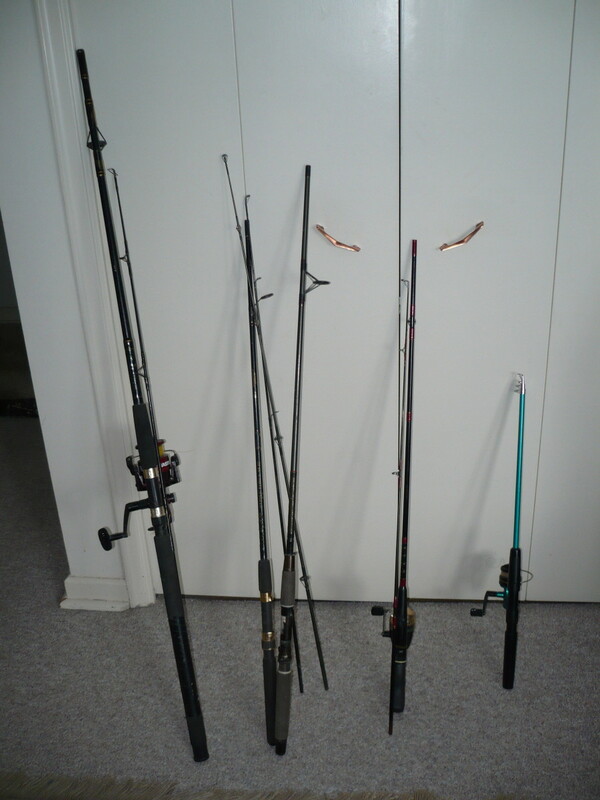 I'm hoping to try my hand at saltwater fishing when I go down to visit my mother in Florida this next year. Thank you for such a beautiful and inspiring hub. (I'm currently experiencing snow) It gives me hope for warmer and more beautiful memory making. Thank you Eiddwen. Sounds like you have a fishing buddy to share the sport with. It doesn't get any better than that. My partner is an avid fisherman and I have develpoed an interest. This one is so interesting. Thank you livelifeworryfree. I am happy to inspire salt water fishing to your bucket list. This is the first time I did that. WOW what a compliment. I love fishing. Heck I grew up next to a river. Out of all the family fishing vacations that I went on as a child I've never been salt water fishing. This beautiful hub is responsible for me adding salt water fishing onto the bucket list. Beauty should never be passed. Thanks for sharing. Thumbs up! Yeah it was a small piece of Heaven for sure Billy buc. Thank you for your comment. I also like the seasons and the different plants, flowers and veggies that each season offers. Seriously, I don't think I could live there. I love the seasons and your weather is a bit too perfect. LOL Having said that, I would love to be there right now fishing for a couple weeks in shirtsleeve weather.